If your looking for an excuse to combine your love of pom-pom making with cats, then I have a DIY for you! 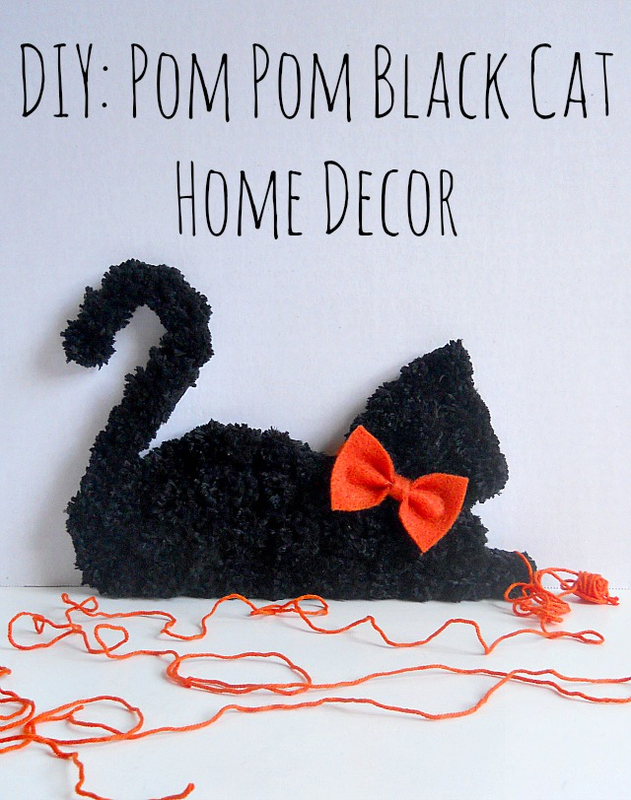 In honor of Halloween being about a week away, today I'm going to be sharing with you this fun Pom Pom Black Cat Home Decor DIY (try to say that five times fast)! Now this project is one of those easy peasy lemon squeezy projects. You don't need any mad craft skills and you probably already have most of the supplies needed for this project. So grab your pom-pom maker and let's make a non-scary Halloween craft! Step 1: Find a silhouette image of a cat that you like and print it out. Then use that image as a template and trace around it onto your piece of cardboard. 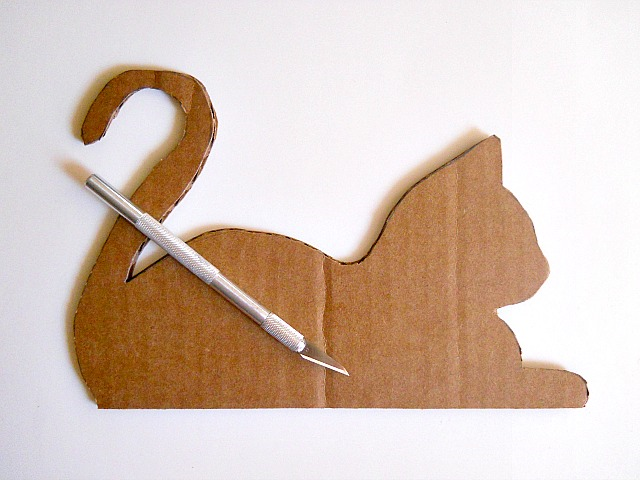 As a side note, I linked the image that I used under the supplies section but you could also free hand your cat silhouette, if thats more your style! 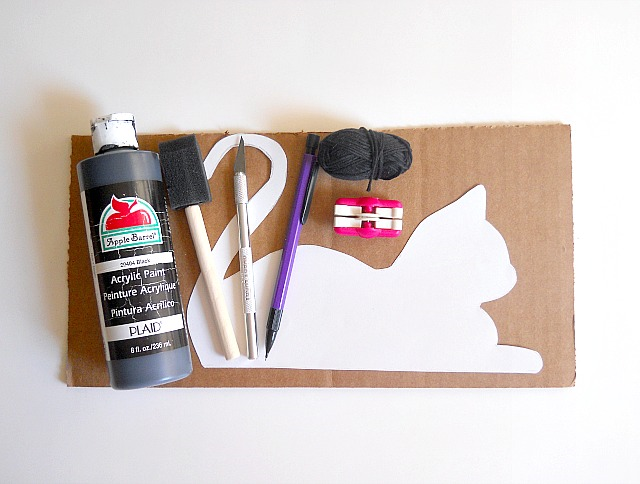 Step 2: Cut out your cat image with a craft knife. Step 3: Paint your cat black, then set it aside to dry. If your wondering why were painting our cat, its so that everything looks the same once the pom-pom are glued on. For example, instead of seeing brown cardboard, you really being seeing black cardboard which blends in with your black pom-poms. 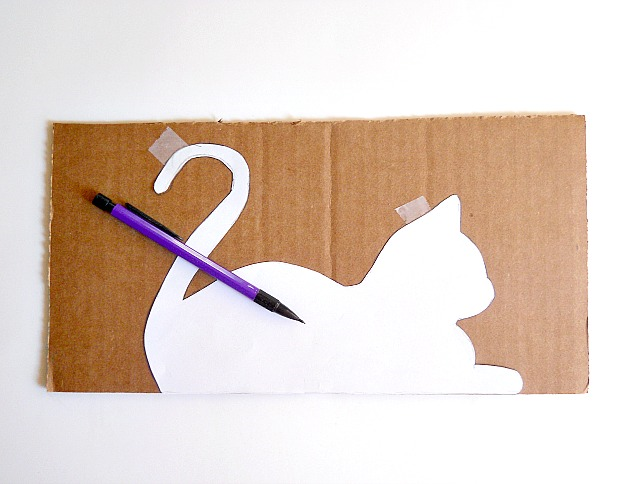 Step 4: Use your pom-pom maker and create enough pom-poms to cover your entire cardboard cat. For my cat I ended up making about 40 pom-poms. Now I know that seems alike a lot, but I was using an extra small pom-pom maker. So depending on the size of your cardboard cat image and the size of your pom-pom maker, you may need to make more or less pom-poms. If you have never used a pom-pom maker before, then I would suggest checking out this awesome video which shows you (from start to finish) how to use a pom-pom maker. Step 5: Now take your hot glue gun and glue on each of your pom-poms on top of your cardboard cat. 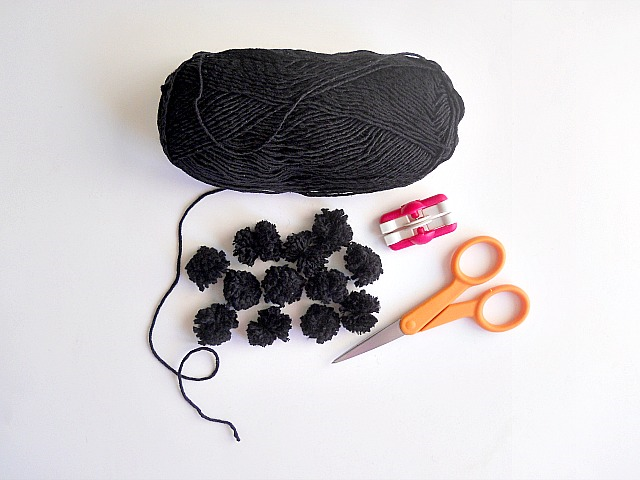 Once all your pom-poms are glued on, use your scissors to trim around all the edges. 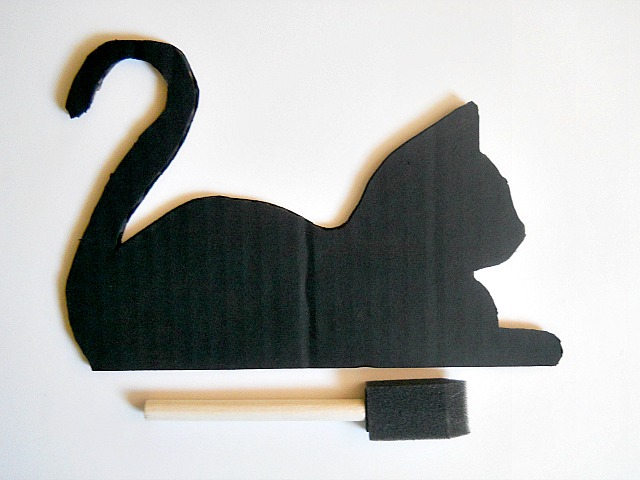 This will help make your cat look more lifelike and will help defined the actual outline of the cat. When your happy with the look of your pom-pom black cat, then your done! 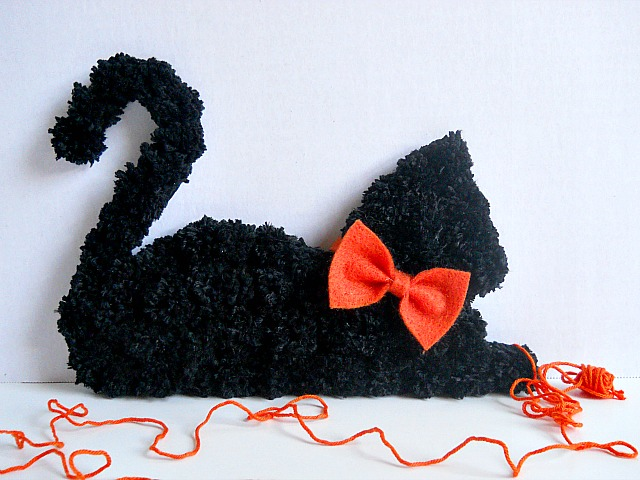 After I was done creating my pom-pom black cat, I made an orange bow out of felt. I then hot glued the bow to my cat to make him look more ''fancy'' for Halloween! 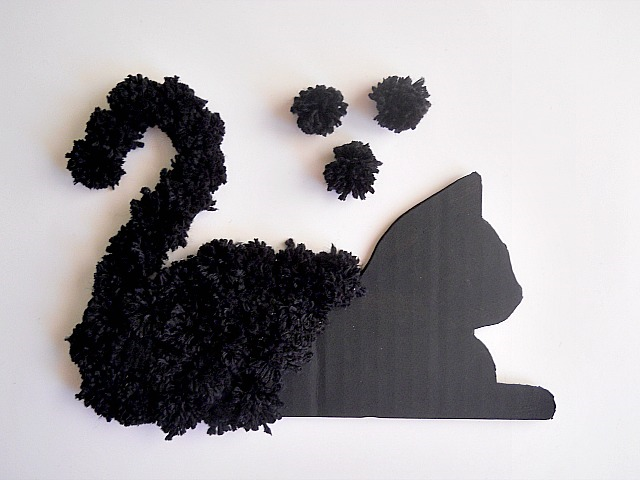 Now I ended up siting my pom-pom black cat on my bookshelf, but you could place him in a window or glue a picture hook on the back, to hang him up on the wall. So what do you think? 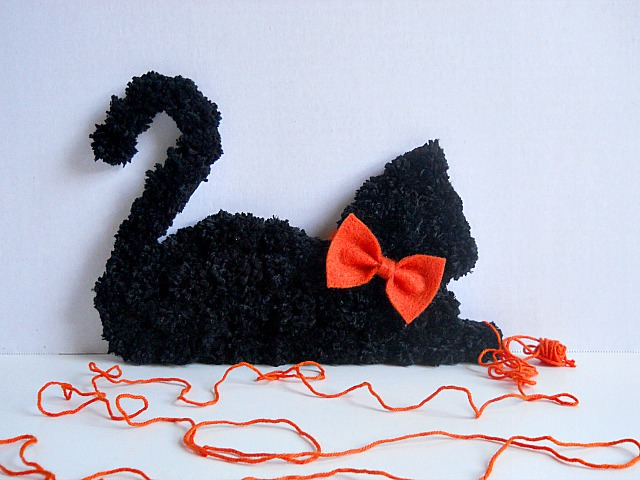 Do you love this little Pom Pom Black Cat? This little guy is adorable! I love making pom poms. I know, making pom poms is so addicting! Yes to Pom Poms and kitty cats!! Love this! Thanks Pattymac100! You can never go wrong with kitties and pom-poms! I love your felt bow tie! I would love to use that idea on my blog for people who don't knit but want to craft. It probably won't run until the new year, but I'd love to include it somewhere! It's really cute. If you have any tips on making them? Maybe you can do a guest post on it? Any interest? Thanks! 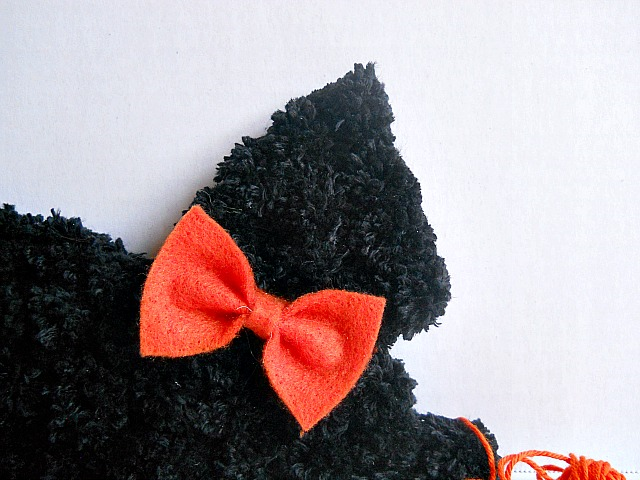 The felt bow tie is really easy to make and can be used in a ton of different craft projects! I would be happy to do a guest post on it, if your still interested. What is the name of your blog? I'm PattymacKnits.com. I had someone tell me they were too intimidated to try knitting, but something they could do that was still crafty would be appealing to them. Maybe we can do this for the new year???? I knit for dogs and have some patterns, so showing people how to do the bowties would be a fun extension. I love your site!!! The idea of doing a pattern for a dog would be fun because I just got a new puppy! Also depending on your readers, I could show them how to make the bow either by sewing or using hot glue. I'm at PattymacKnits.com. Thank you!! I'm definitely interested!!!!!! My content calendar is pretty full for December, but if you would be interested in doing something together in the new year, I would love it! !